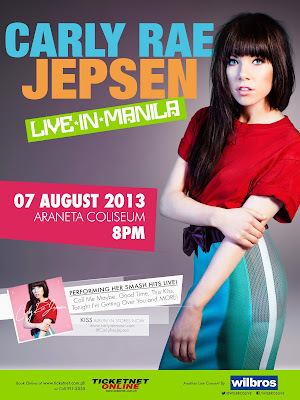 International pop star Carly Rae Jepsen is coming to Manila during her Kiss Tour on August 7, 2013 at the Araneta Coliseum. The Canadian singer/songwriter took the world by storm in 2012 with her global hit single "Call Me Maybe," which was a number one song for 9 weeks and went on to sell more than 10 million copies worldwide. Her official YouTube video for the song has over 400 million YouTube views. Carly’s newest single, “Tonight I’m Getting Over You” is also creating waves around the world, especially the remix version that features Nicki Minaj. Meanwhile, Carly is touring with Justin Bieber in the US, but touring alone in Southeast Asia. Tickets to her Manila concert can be bought at TicketNet outlets, online at www.ticketnet.com.ph, or on the phone by calling 911-5555. For more information about the concert, call Wilbros Live at 374-2222. Follow Wilbros Live on Facebook (fb.com/WilbrosLive) and Twitter (@WilbrosLive).